For Tim, Jeri, Lizzie, and Josiah, today (Thursday) was the very last day to go to Disneyland before their passes expired. The rest have two days in April that they can possibly go. Today was also the last day before the Spring Break block-out dates. Knowing that the end is near, Justin, Nicole, Jason, Victoria, and Jeffrey also decided to join. Joanna had class; Sarah had stuff that she had to work on. Because we knew that the parks would be crowded, our main goal was to watch the new (and improved) fireworks show at 9:10 PM. So we headed out after work. The first group took the van and picked up Jason from his office. The second group (Tim, Jeri, and Justin) also stopped by Jason’s office but after texting him realized that he was already in the van! Oh, well. We got the park between 6:00 and 6:30 PM. 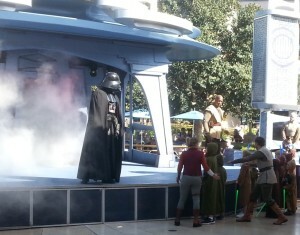 The first group headed to Disneyland and Tomorrowland with its Star Wars attractions. The wait times were way too long. So they watched the 10-minute movie montage, “The Path of the Jedi,” which had clips from all of the Star Wars movies. Jason, Jeffrey, and Josiah did Buzz Lightyear’s Astro Blasters. 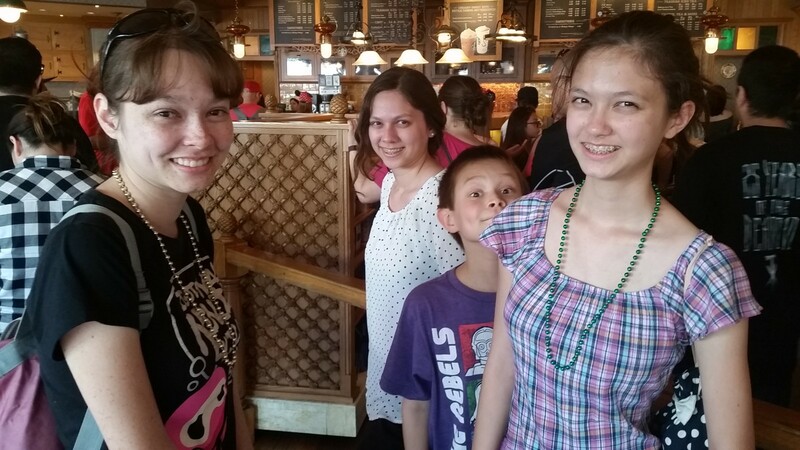 The girls (Nicole, Victoria, and Lizzie) headed to Boudin’s Bakery for some sourdough bread. 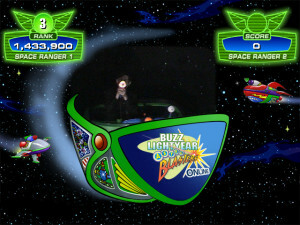 Jeffrey with third highest score of the day on Buzz Lightyear Astro Blasters. Click photo for full size. The second group (Tim, Jeri, and Justin) made it to Cars Land in time to catch the lighting and “Sh-Boom” (“Life Could Be Dream”). They then got Fast Passes for the California Screamin’ roller coaster. While waiting for the return time, they watched a 4-D trailer preview of the upcoming new Jungle Book movie. 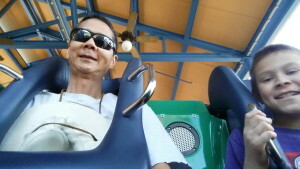 Following the movie, they rode the roller coaster for one last time. 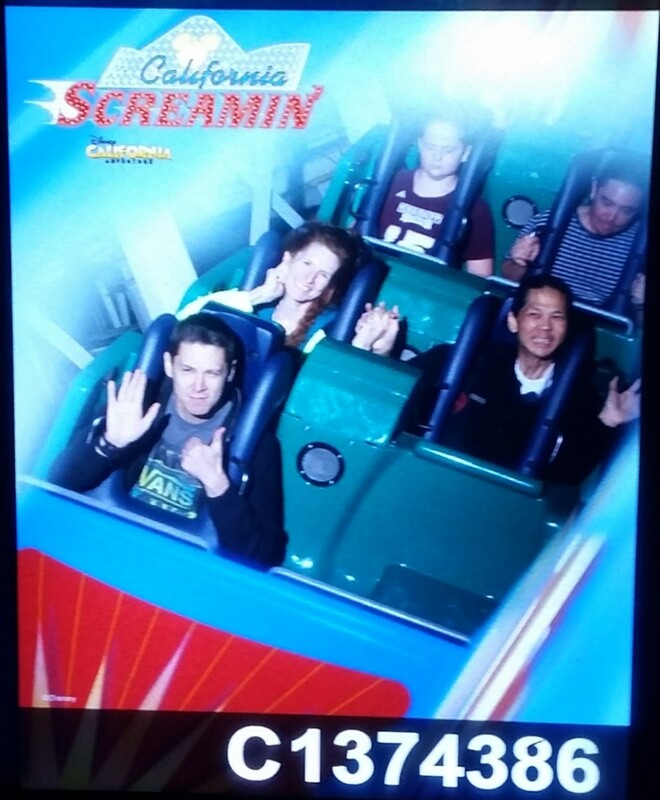 California Screamin’ – Justin, Jeri, and Tim. Click photo for full size. After that, everyone met up outside of the bakery. Some bought a loaf of bread and ate slices with Disney butter. Around 8:30 PM, we all headed to Disneyland to prepare for the firework show, “Disneyland Forever.” We walked through Cars Land. 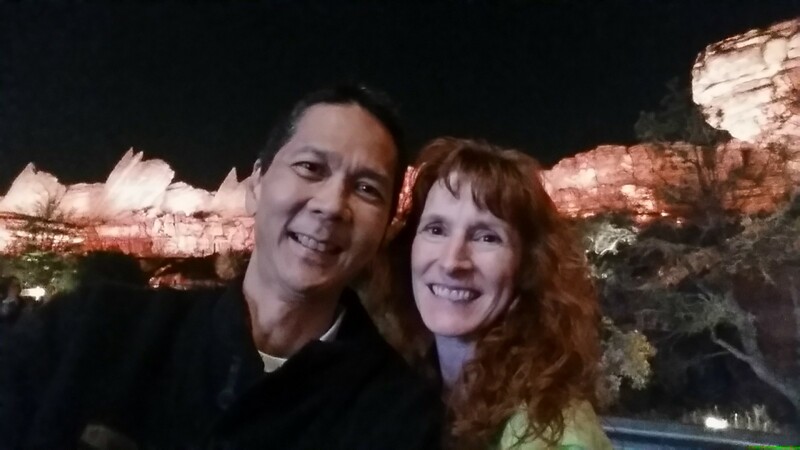 Tim and Jeri in Radiator Springs. Click photo for full size. Here we are next to Flo’s Cafe. Due to a reflection, Jeffrey has “zombie” eyes. Victoria, Jeri, Jeffrey, Nicole, Josiah, Justin, and Lizzie outside Flo’s Cafe. Click photo for full size. 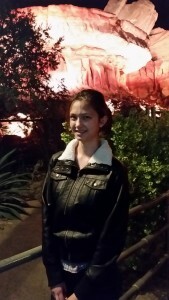 Lizzie in Cars Land. Click photo for full size. 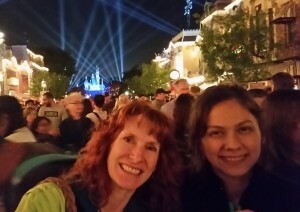 We made it into the stores on Main Street while the “Paint the Night” parade went by. The lighted floats synchronized with the music were quite impressive. Paint the Night Cars Float. Click photo for full size. After the parade, we moved into the street to pick a viewing spot for the fireworks. As the scheduled time arrived, we heard “Ladies and gentlemen, boys and girls. Due to unsafe conditions at higher altitudes, the fireworks show has been canceled.” Waah! 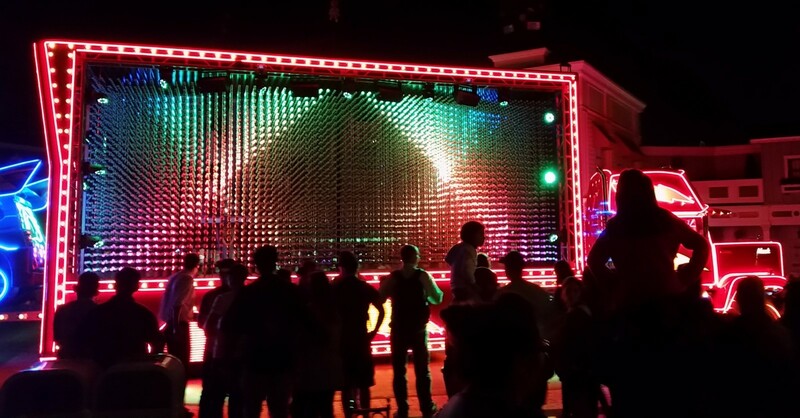 However they did display a light show with music for a few minutes. Disneyland Lights Up Main Street. Click photo for full size. Jeri and Victoria after the Light Show. Click photo for full size. Following this, Jason, Victoria, and Josiah did Star Tours. Nicole and Lizzie did the 4-D Jungle Book preview movie. Justin and Jeffrey watched the World of Color. 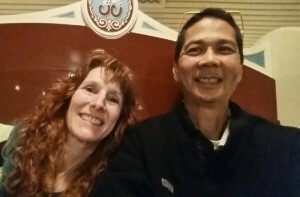 Tim and Jeri did Toy Story Midway Mania where the wait time was a very short under 15 minutes. After doing it once, they immediately got back on for one last time. Jeri and Tim Selfie on Midway Mania. Click photo for full size. 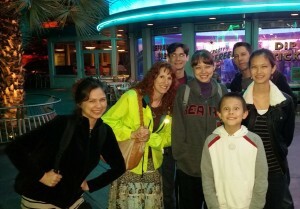 Those of use in California Adventure met up and headed out of the park. Tim and Jeri took a few minutes to do a little shopping so Tim could get a Mickey mug for his office. Jason, Victoria, and Josiah got in the long line for the shuttle buses back to the parking lot. When the other six saw the long line, they decided that they could walk the mile back to the vehicles faster than waiting for the buses. The speed walkers (Justin, Nicole, Jeffrey, and Lizzie) got back about five minutes before the bus riders (Jason, Victoria, and Josiah). Tim and Jeri arrived the same time as the bus riders. By the time that we made it home, it was 11:30 PM. We made it to bed after midnight! On Tuesday, March 15th, 2016, five of us (Tim, Nicole, Victoria, Lizzie, and Josiah) went to Disneyland. Since our annual passes are close to expiring, we wanted to take advantage of the opportunity. Tim took the day off from work. We left home at 7:30 AM, drove 30 minutes to the Disney parking lot, and took a Disney shuttle bus to the parks. The parks (Disneyland and California Adventure) opened at 8:00 AM; so we arrived a little late (8:15 AM). Josiah and Tim headed to Disneyland to sign up for the Jedi Training. The girls headed to California Adventure (CA) to try the new ride, Luigi’s Rollickin’ Roadsters. 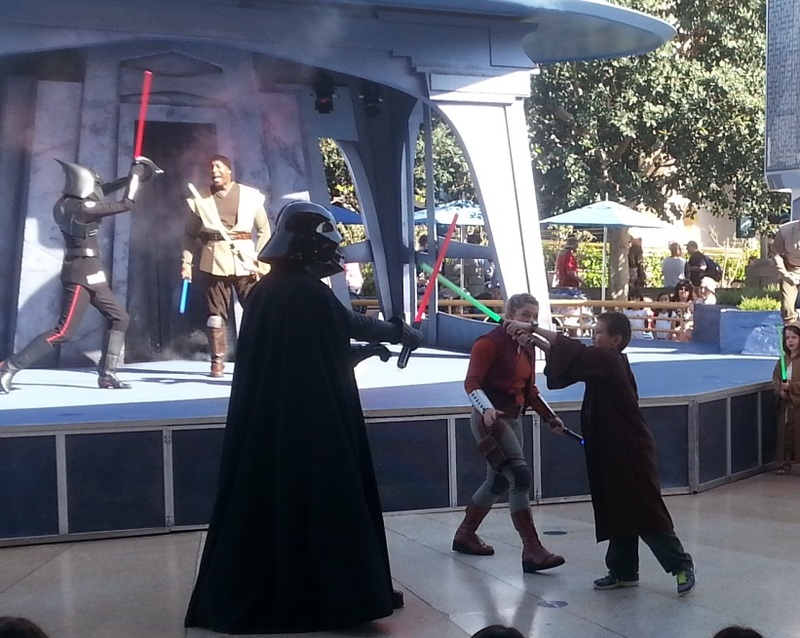 Josiah and Tim waiting to sign up for Jedi Training. Click photo for full size. By the time that Tim and Josiah made it the front of the signup line for Jedi Training, four of the six sessions were completely full and the last two were mostly full. But they got a slot for the 3:30 PM training. 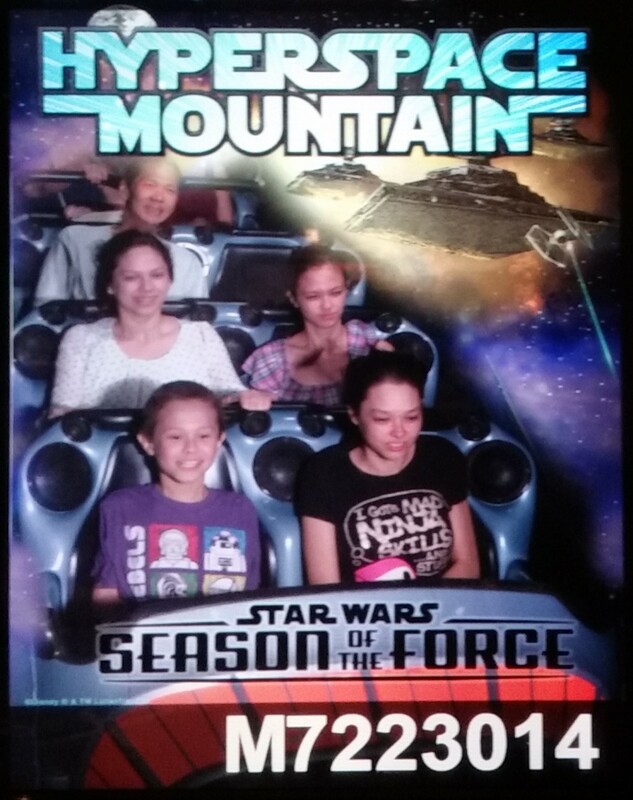 The girls joined us at Disneyland and we all got Fast Passes for Hyperspace Mountain (which is the Space Mountain roller coaster converted with a Star Wars theme). We all headed back to California Adventure where we first picked up Fast Passes for the World of Color and then Fast Passes for Soarin’ over California. Because our return time for Soarin’ wasn’t too far off, we had a little time to kill before we could get Fast Passes for California Screamin’. So we did Goofy’s Sky School with a minimal five minute wait. Goofy’s Sky School is a roller coaster that makes you feel like you are going to get thrown off of it. We stopped at the Bakery Tour to get our free piece of bread. Here’s Tim and Josiah nearing the end of Goofy’s Sky School. Nicole and Elizabeth are in the car behind us! 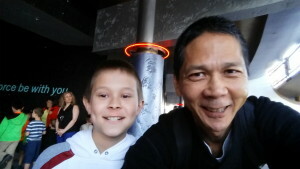 Tim and Josiah at Goofy’s Sky School. Click photo for full size. After we picked up our California Screamin’ Fast Passes, we went and did Soarin’ over California. 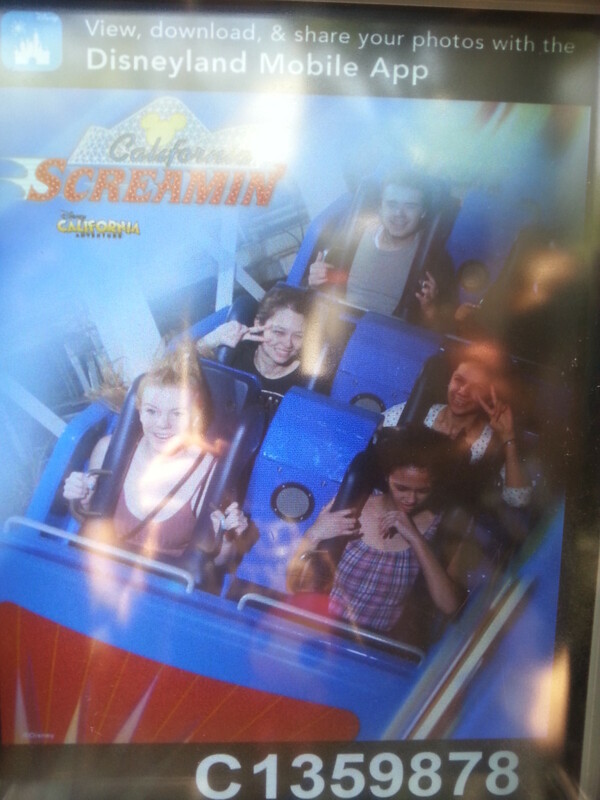 Then we returned to do California Screamin’. Here’s Tim and Josiah with a selfie in the loading area. 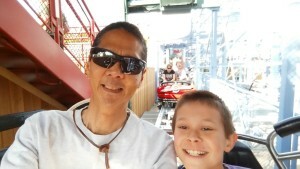 Tim and Josiah getting ready for California Screamin. Click photo for full size. 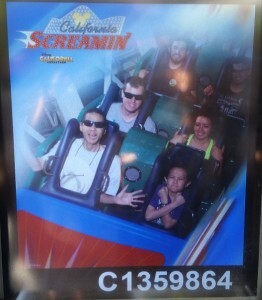 Tim and Josiah in the very front of California Screamin. Click photo for full size. California Screamin’ Lizzie in Front Right, Nicole and Victoria in Second Row. Click photo for full size. Next we bought some sourdough bread at Boudin’s Bakery. 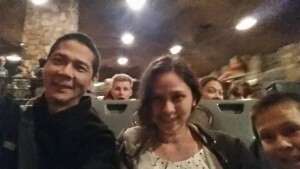 We kept an eye on the return times for Radiator Springs Racers; we wanted to do the ride after sundown. So after a short while, we got our Fast Passes. Next we headed out of the park to to our locker to eat lunch. After lunch, we headed to Disneyland. 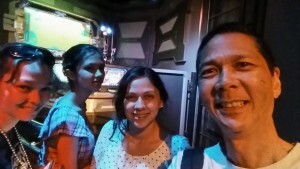 First stop was picking up Fast Passes for Star Tours. Next stop was to Hyperspace Mountain. Once again, our strategic use of Fast Passes saved us a LOT of wait time. Josiah, Nicole, Victoria, Lizzie, and Tim on Hyperspace Mountain. Click photo for full size. 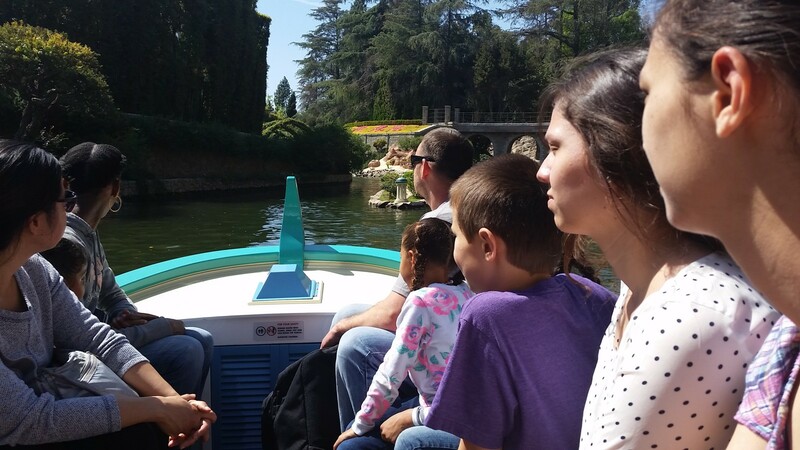 Next we did the Storybook Land Canal Boats. Here we actually had to wait in line for maybe 20 minutes. Storybook Land Canal Boats – Josiah, Victoria, and Lizzie on the left. Click photo for full size. 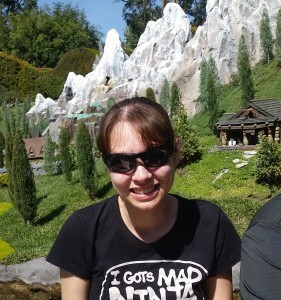 Nicole on Storybook Land Canal Boats. Click photo for full size. 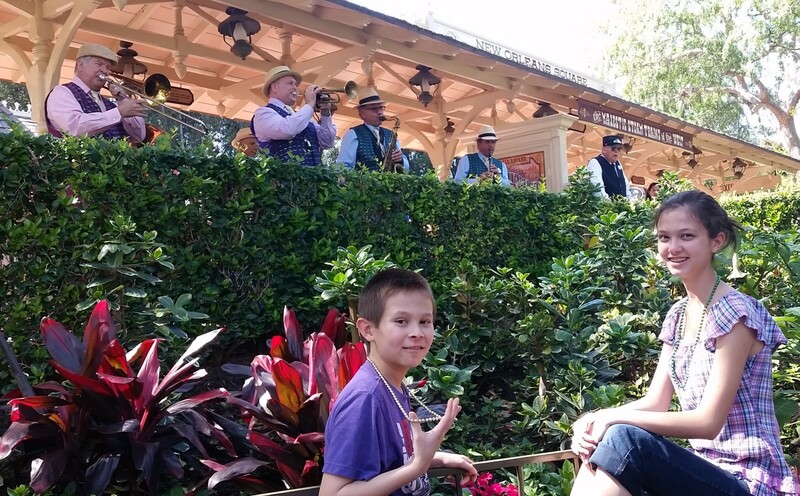 We then headed to New Orleans Square where we caught the very end of Jambalaya Jazz. Josiah and Lizzie at New Orleans Square. Click photo for full size. 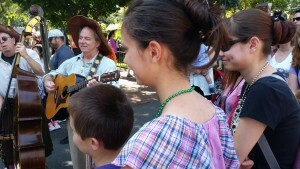 Then we caught the Bootstrappers, a pirate musical group. They were a lot of fun. Josiah, Lizzie, and Nicole listening to the Bootstrappers. Click photo for full size. Next stop was Starbucks on Main Street. 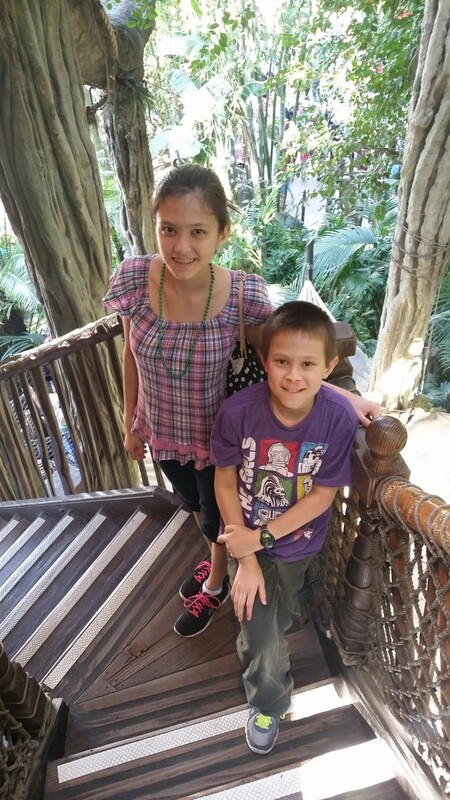 On our way, we stopped by Tarzan’s Treehouse. Lizzie and Josiah at Tarzan’s Treehouse. Click photo for full size. 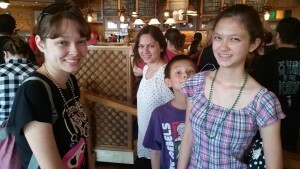 Nicole, Victoria, Josiah, and Lizzie at Starbucks. Click photo for full size. Because the time was approaching 3:00 PM, Tim and Josiah left Starbucks and headed to the Star Wars Launch Bay to prepare for Jedi Training. The training was at 3:30 PM. We were pleasantly surprised at how much fun the show was. 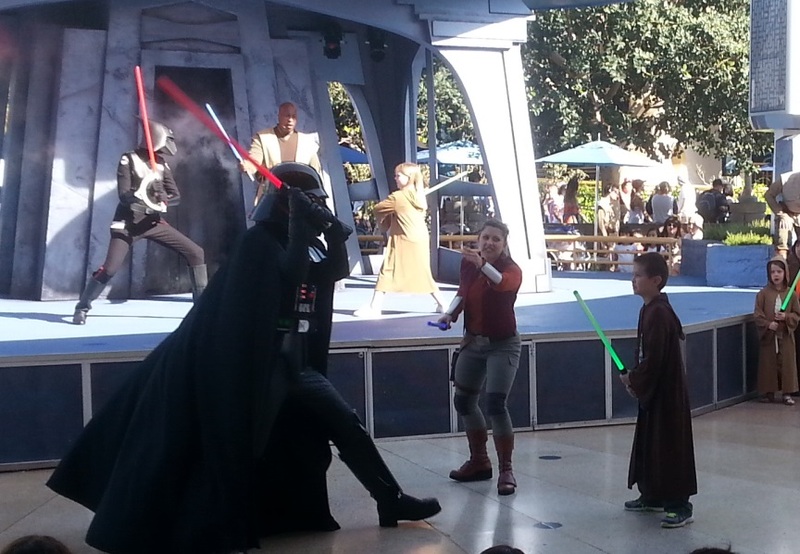 Josiah had a great time fighting Darth Vader! Darth Vader appears. Click photo for full size. 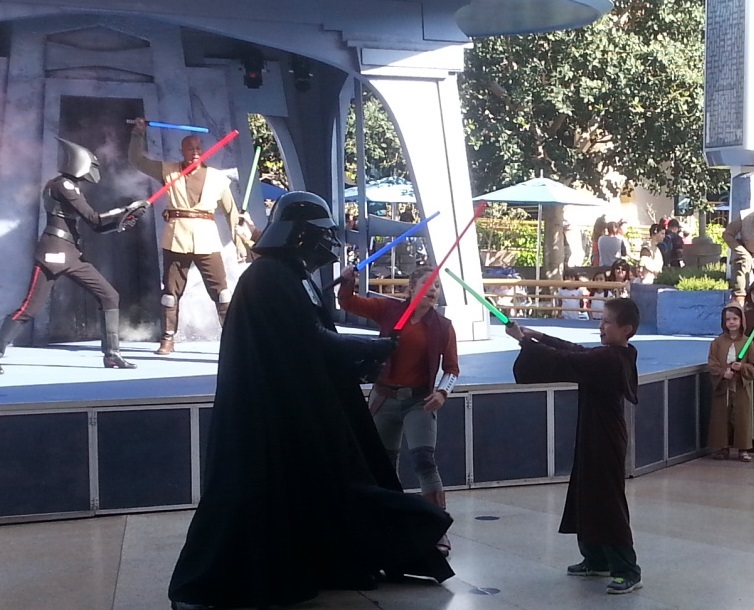 Darth Vader approaches Josiah. Click photo for full size. Darth Vader takes on Josiah. Click photo for full size. Josiah attacks Darth Vader. Click photo for full size. Next stop was the Enchanted Tiki Room. During the show, Tim (who saw the show last week) got Fast Passes for everyone for Big Thunder Mountain Railroad. After the Tiki Room show (with singing, animatronic birds), we got to use our Fast Passes for Star Tours. 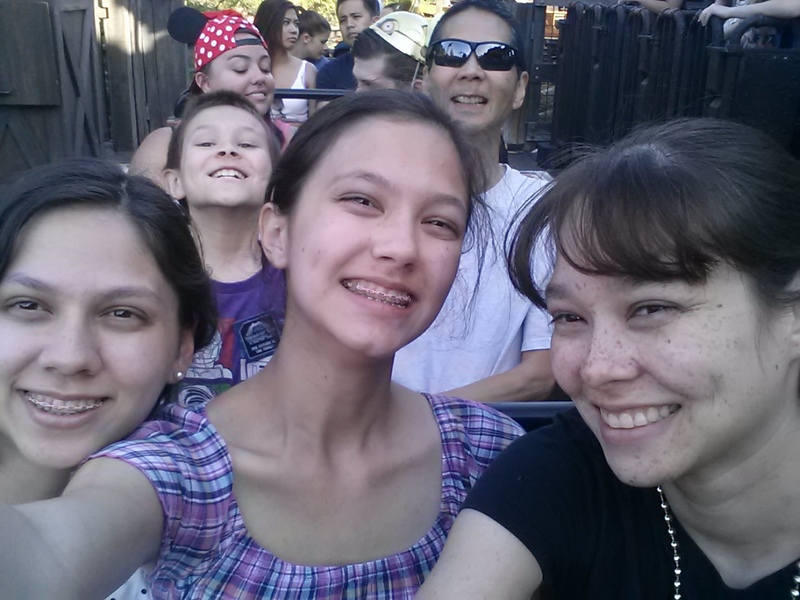 Nicole, Lizzie, Victoria, and Tim in line for Star Tours. Click photo for full size. 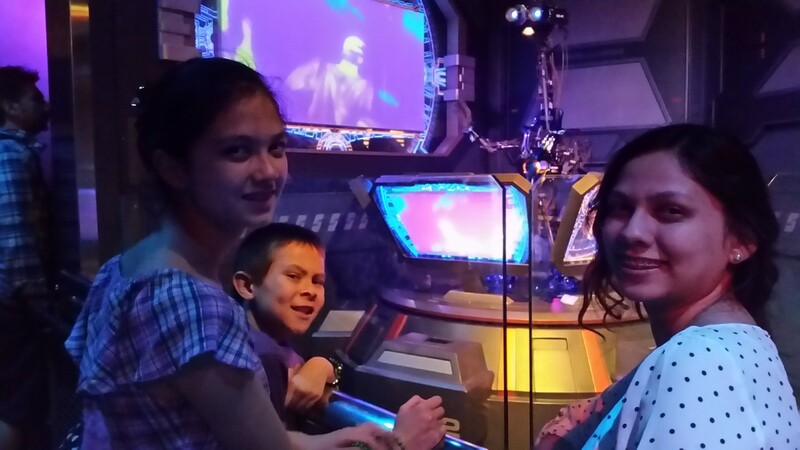 Lizzie, Josiah, and Victoria nearing the end of the line for Star Tours. Click photo for full size. Now it was time to use our Fast Passes for Big Thunder Mountain Railroad. 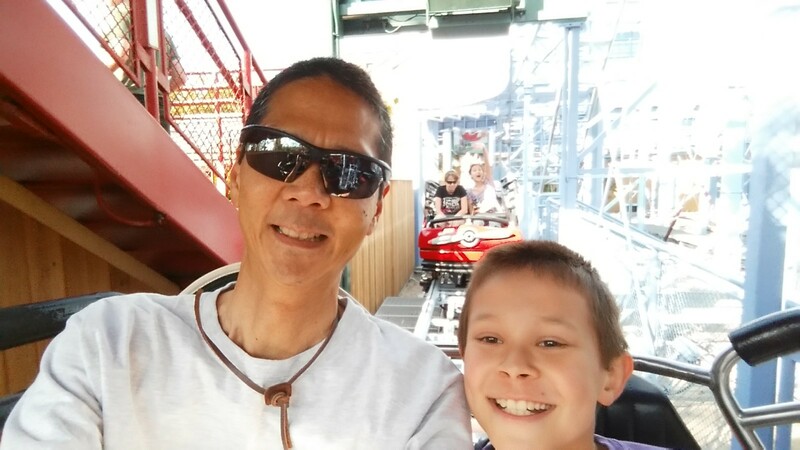 The new roller coaster is a great improvement! Big Thunder Mountain Railroad – Victoria, Lizzie, Nicole, Josiah, and Tim. Click photo for full size. To finish our day at Disneyland (before heading to California Adventure), we saw Captain Jack Sparrow at the Pirates of the Caribbean. Pirates of the Caribbean – Josiah, Nicole, Victoria, Tim, and Lizzie. Click photo for full size. Finishing the ride around 6:40 PM, we knew that we had about 20 minutes to get to Cars Land. 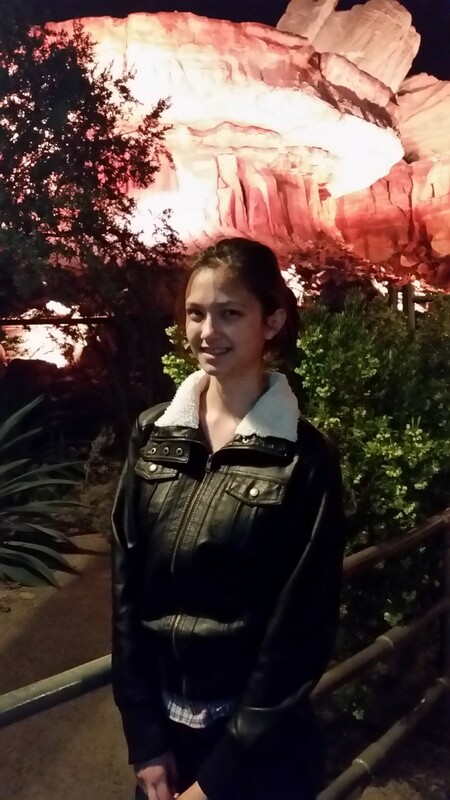 So we walked briskly out of Disneyland. We picked up our food, jackets and refilled some water bottles at our locker. 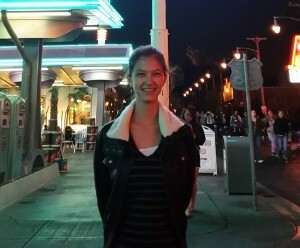 Then we entered California Adventure and headed to Cars Land. We made it with five minutes to spare. We enjoyed hearing “Sh-Boom” and watching the lights come on at Cars Land. 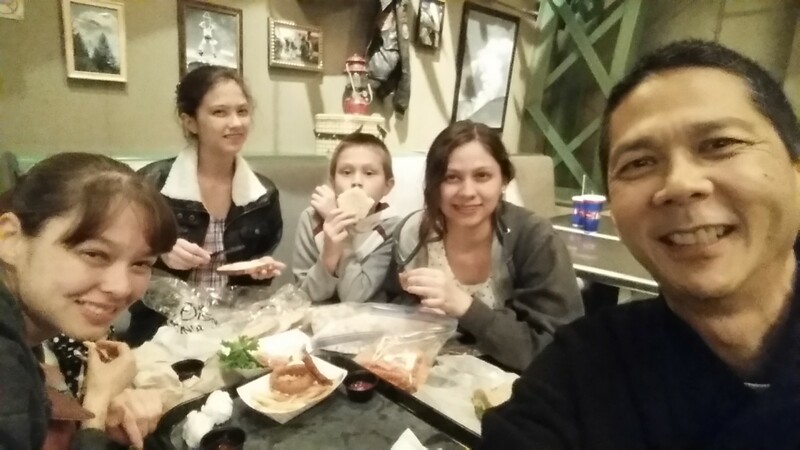 We went to Smoke Jumpers Grill to get an order of fries and onion rings. We sat at a table and ate our supper. We stopped at Starbucks next door afterwards. 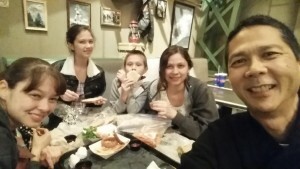 Eating supper at Smoke Jumpers Grill. Click photo for full size. 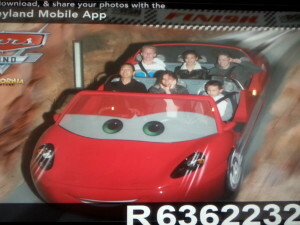 Next we did Radiator Springs Racers. Here’s a selfie in the car. Tim, Victoria, and Josiah are in the front seat. An unknown single rider along with Lizzie and Nicole are in the back seat. 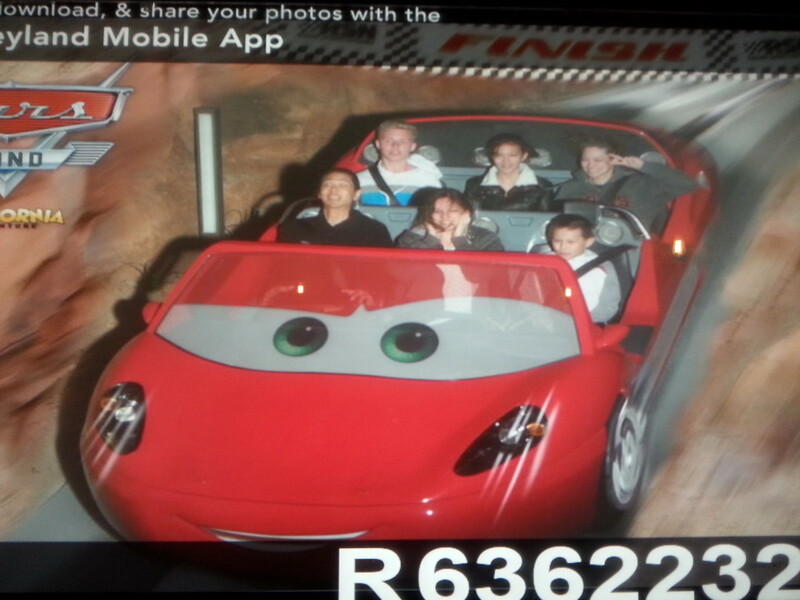 In a Radiator Springs Racer. Click photo for full size. 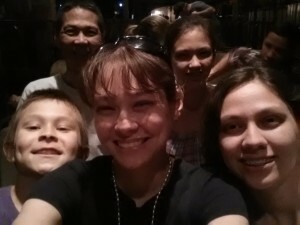 Radiator Springs Racers – Tim, Victoria, Josiah, Unknown, Lizzie, and Nicole. Click photo for full size. Finishing the ride, we headed to Paradise Pier to get a spot for World of Color. After about a half hour wait, we watched another impressive show of video, lights, lasers, water and fire. Amazing! Now it’s after 10 PM, so it’s time to head home. We get in line for the shuttle buses. After a few minutes, Nicole asks if we got our stuff out of the locker. Nope! So Tim dashes back to get our stuff (including the car key). Finally we make it home at 11:00 PM and bed by 11:45 PM. We were gone from the house for 15 1/2 hours! What a day. Pau is exceptional as Mademoiselle Warblewell and holds her own against Eldridge in their operatic showdown. At first glance Pau appears shy and timid but quickly puts those assumptions to rest as she fully embraces her inner diva and takes command of the stage. She is a vocal force to be reckoned with her bell-like soprano vocals and her acting is also top notch.